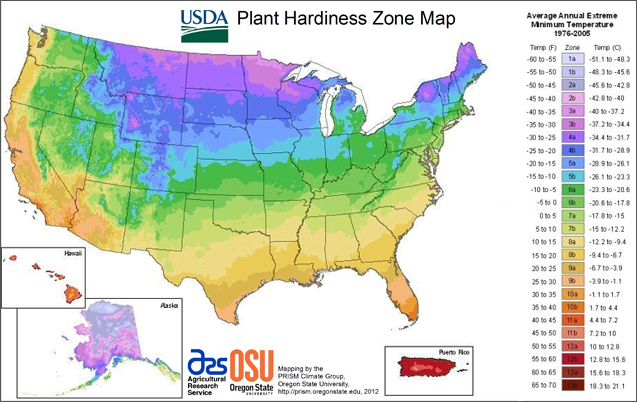 Before we dive in, check out the Hardiness Zone Map below to see what trees will thrive in your area. Once you determine what zones your trees are suitable for, there are additional factors that need to be considered. Height — How tall of a tree can your landscape accommodate? Will power lines or obstacles get in the way? How will its height relate to the other trees or plants in your landscape? Do you have enough space for tall tree given the amount of space you have to work with? Consider other trees and plants in your landscape, too. Canopy — How wide will the tree grow? This consideration is similar to height in that you also need to consider other trees or structures nearby. Do you plan to plant bushes and shrubs under the tree/s? Consider which landscape elements can tolerate the shade the canopy will provide. Form or Shape — Similar to the considerations for canopy and height, the shape of a tree should be suited to the amount of space you have to work with. Logistics aside, take into consideration that trees have different shapes—that is, some are pyramidal, some are more broad and oval. Growth Rate — Especially for new homes or construction projects, how fast your tree grows could be a factor. For example, if you want to create as much shade as quickly as possible, go with the faster growing trees (Shade Trees generally grow at a decent clip) or invest in a more mature tree. Soil, Sun and Moisture — Definitely consider your environment when planting your trees. Some trees do well in sandy soil and some do not. Others can survive in near drought conditions and some need plenty of moisture. Some prefer certain soil types, while others thrive in various soils. How much sunlight a tree needs is also a factor and can determine the kinds of trees that can co-exist in your landscape. Not sure where to start? We’re here to help! Browse our extensive tree selection and find the perfect match for your landscape! If you have any questions, feel free to email us or call us at 317.225.4732.